At our school, we believe that a strong school philosophy is the basis for everything. So, every year in August, we spend our first day of professional development reviewing, revamping, and discussing our philosophy among teachers and coordinators. After 18 years, it can be difficult to come up with new ways to do this — luckily, this year, Breakout EDU came to our rescue! 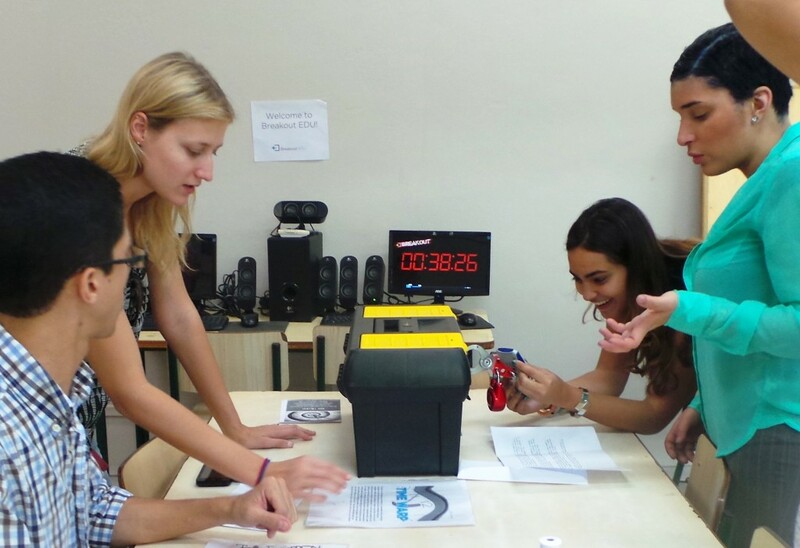 What is Breakout EDU, Anyway? Last year, while visiting Toronto, my daughter took me on an “Escape Room” adventure. We were locked in a room with nine other people we’d never met before and had to find clues and solve a series of puzzles in order to unlock the door and escape. Not only was it fun, it was something I could easily imagine being used in school. To escape, we had to collaborate, problem-solve, use logical thinking skills, and access prior knowledge. Doesn’t that sound just like what we want students to do? 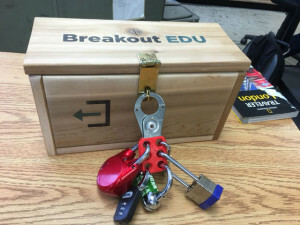 As I was working with teachers to figure out how we could invent Escape Room problems for school, I discovered that the solution had already been invented: with a series of locks and boxes, Breakout EDU creates escape games for students. Their website is amazing, with over 250 games available for teachers to use. They also have a Breakout EDU Facebook page where educators share ideas, materials, problems, and solutions. It’s extremely helpful and inspiring! 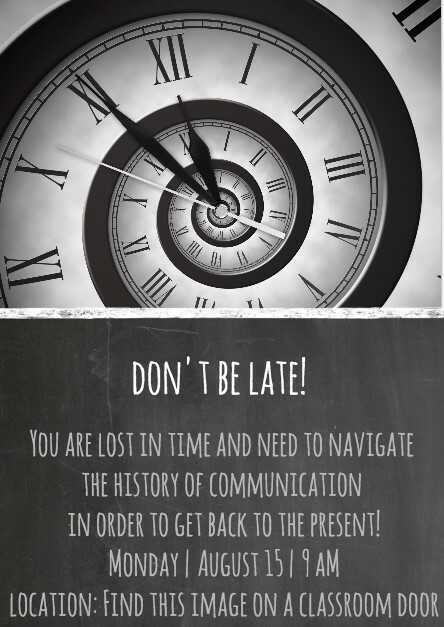 We decided to break our teachers up into seven groups of eight teachers each, and we chose three games to play: Dr. Johnson’s Laboratory, Time Warp, and the Missing Assignment. We made two copies of each game, and translated Dr. Johnson’s Laboratory into Spanish for our Spanish department. When teachers arrived on Monday morning, they found a table full of invitations waiting for them. The invitations invited them to find their assigned room and go there at 9:00. At that time, we met outside the rooms and explained that they had to find clues in order to open the mystery box. We took the teachers into the room, where a timer was set up on a computer. We told them they had 45 minutes to solve the problem, then started the timer. Teachers searched for clues throughout the room and began trying to solve the problems. The clues were definitely not easy and red herrings also tripped them up. We gave a few hints like: “Keep searching, you need more physical clues.” or “Hmmm, could it mean something else?” Some groups solved the challenge and broke into the box, where they found chocolate (of course) and an envelope with eight copies of a word in it and instructions to meet in the classroom where we were holding our philosophy workshop. Each group had a specific word that they’d share in a jigsaw like activity in our workshop. Other groups didn’t manage to break out in time – so we opened the boxes and gave them the words they needed to continue. Groups were given a piece of paper and markers. 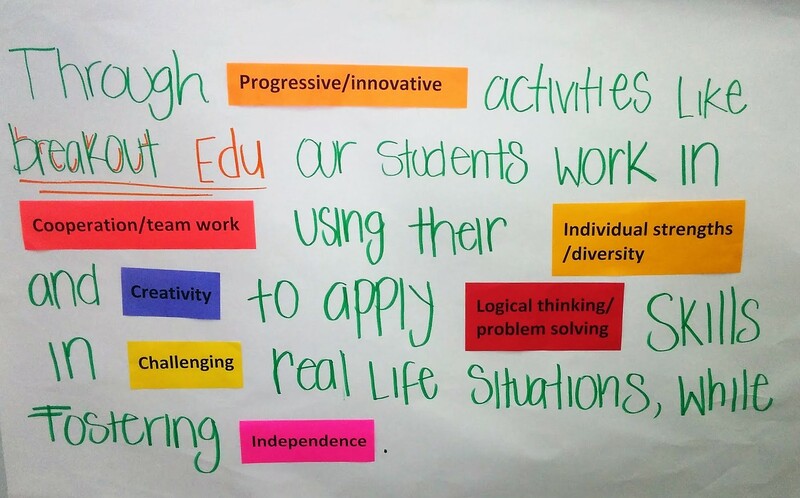 We asked teachers to use the words to come up with a paragraph explaining how the Breakout EDU activity represented our philosophy. We listened in on deep discussions as teachers completed the tasks. We reached our goal, with no lecturing on our part! Develops problem-solving and critical thinking skills. Fosters a growth mindset – failure is okay when you’re playing a game. Part of the fun is trying again. Feelings of insecurity turn into “Yes! I can do this!” when teachers manage to solve a problem. Encourages perseverance – some students give up easily when faced with a challenge. In attempting to break out, they begin to see that “intelligence” doesn’t count as much as the willingness to keep trying. Accesses content knowledge – the puzzles can be built around content being covered in class and, even better, students can eventually create games for each other, using subject area content clues. Finally, it’s fun! – Breakout EDU is exciting and motivating. As one of our teachers said: “I think this was my favorite back to school day ever, including my entire childhood!” It’s definitely an activity we’ll be using again, in many different ways. I love this! I will definitely be checking out Breakout Edu! Our staff (and students) could use a boost like this! Susie, I highly recommend it. Teachers loved it and it set a great tone for the beginning of the year. What a fun jumping off point for the weighty philosophical conversations that followed. Thanks for the glimpse, Carla. Thanks for reading Brian. I’m sure what the teachers liked best was that I didn’t have to talk at all! I’m glad you liked it Gillian. Next time I’d like to invent my own game, using the clues to teach…but that will be a little more work! I love Breakout EDU. We created a game to use in one of our trainings last year. It was such a huge hit. It amazes me how many different content areas can be addressed and the skills and benefits of working in collaboration with peers just make the experience that much more valuable. Great post! Any idea if there is another professional development for breakout edu. A co-worker of mine stumbled across it and are we are so intrigued. If you go to the Breakout EDU website at http://www.breakoutedu.com/ you might find information there. 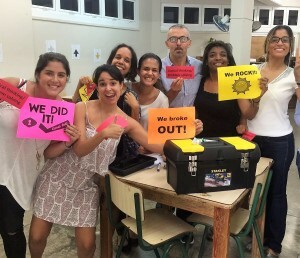 There’s also a wonderful Breakout EDu facebook page where people share information and you can ask questions: https://www.facebook.com/groups/breakoutedu/ I hope these help! Reframing a Paradigm for Professional Learning: Part 2 | Inside the classroom, outside the box!